Psquare: Celebrating a New Age Today. 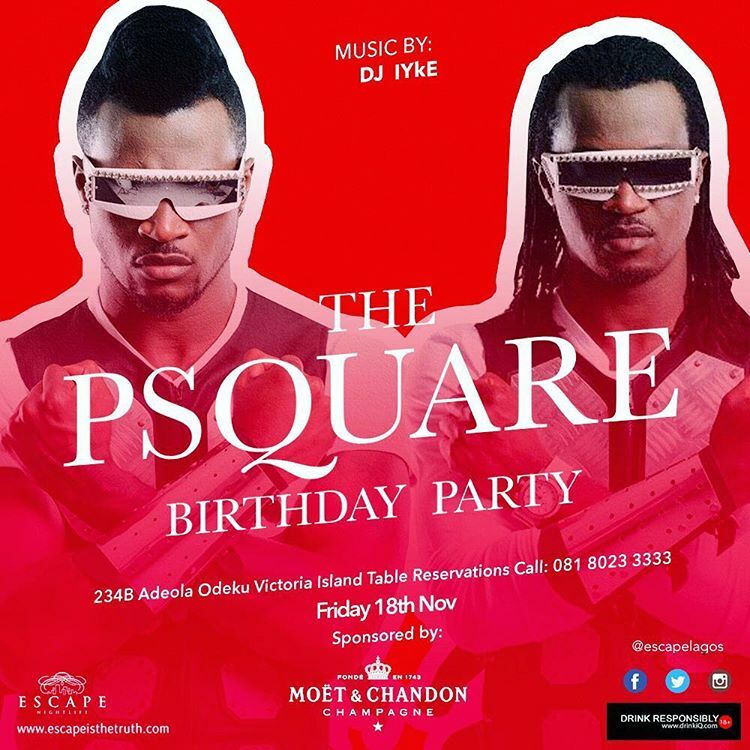 Psquare, Peter and Paul Okoye clock a new age today and would be celebrating It with a party tonight at Adeola odeku, Victoria island lagos. The duo also uploaded a throw back pics of themselves when they were about 2-3yrs old to appreciate God for the journey so far. To my favourite twins in the world @peterpsquare and @rudeboypsquare here is wishing you both a very Happy Birthday. I wish you both a lifetime of immense joy, double the blessings double the love and double the success. May your bond never ever break again in Jesus Name. May you continue to love one another unconditionally and support each other fully. I love you guys, your children love you guys, your family, friends, fans and frenemies love you guys incredibly as well ߘʮ Keep up the good work and always remember to consult God first in all that you both do. Una be ONE no be two! Have a wonderful day today as we celebrate you om this great day. We gonna have double the fun! ߍట΂ߙϰߙϢݤ❤ߒ˰ߒˢ؝☝☝☝ߘʰߘʰߘͰߘͰߘ͢ݤ❤ #turnup #psquare #novembertwins #twins #brothers #husbands #birthday #birthdaytwins #uncle #brother #father #family #love #okoyetwins #bankalert #gbagam #bond #unbreakable.